Tanjung Pinang is the second largest city in the province of Riau after Batam, an island where Indonesia and Melayu (Riau) culture blended with a distinctive touch. Tourists visiting Tanjung Pinang can find almost all kinds of tourist attractions, enjoy a delicious culinary called : 'Gonggong', tracing the history of the Melayu-Riau kingdom, explore the banks of the beautiful beaches, and do the bargain, visiting or shopping for branded items at affordable prices at Jalan 'Potong Lembu'. Pulau Penyengat is one of the special tourist island in Tanjung Pinang. Aston Hotel & Resort Tanjung Pinang Rp. 800.000/day, our discounted price 600.000/day. 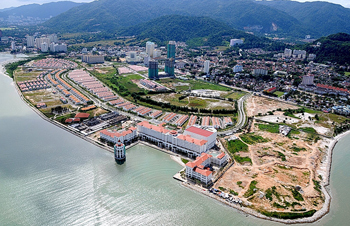 Get Discounted Hotels in Tanjung Pinang Here!